Oh, you guys golf too? I was big into golfing up until 2007/2008 and DH has been trying to convince me to pick up my clubs again. Yeah, I suspect that my clubs are too long. Not only am I short, but I have really long arms for my height. Had DH measure me from my wrist to the floor last night and it's only 31", which according to a chart I found online means I should probably have my standard length ladies clubs cut down another inch. Did you find your clubs got a lot stiffer when you had them cut down? That's my one concern with cutting them down. How much did you have taken off? I'm going to hold off until after my first lesson before I make any changes to the clubs. Get a pro's take on it. I also think I need the grips changed too. I have really long fingers and find myself gripping the clubs really tightly because the current grips are so narrow. If I don't grip the clubs super tight, I feel like they wobble around some when I take my swings. I think the idea was to shorten by 1 inch. Can't say that I noticed any difference in stiffness. I was often choking down before the clubs were cut down. Although not sure I was good enough to really notice a difference in any case. And yes, a bogey to me is awesome at this point. I would be thrilled beyond belief with a bogey!! Last year when I went to the Par 3, we agreed not to count our score beyond 6. Sad to admit, but my score was usually pretty much at the max. I think once I managed a par and gloated (to myself) about that for weeks. This reminds me.....gotta book a lesson. I just had my first lesson yesterday! Worked on basic swing mechanics... completing the end of the swing, making sure I'm hitting under the ball (hitting the tee), getting a full swing. Only worked with irons and the sand wedge yesterday. Had a few good shots! One question for you golfers... do you at any point in your set up straighten your arms? My husband and his dad do, and I've seen other people do this on youtube instructional videos, yet yesterday he had me just keep my arms relaxed and slightly bent. Slightly bent before my swing starts is what I tend to do naturally anyhow. It just surprised me he didn't tell me to straighten my arms. Since fishing has been so bad in recent years, DH and I took up golfing this summer. He has been a golfer on and off for years. I golfed in high school and occasionally with my parents, and later DH, but that was about 20 years ago. I play with a set of Patty Berg ladies' clubs (the woods are actually made out of wood) that are at least 30 years old, and I borrow DH's driver, because I like it better than mine. Besides my hand-me-down clubs from my mother, we have at least two more full sets of ancient clubs in the basement. I never keep score unless I'm hitting well, and I find myself wondering whether a set of new clubs would help improve my game any. I'm also wondering whether I can trade in three sets of "vintage" clubs in on a set of new clubs. I love the hybrid clubs - saw my first one on Sunday. Bring it on, Mother Nature! Ready for ski season! You would be amazed at how much a newer set of clubs will help you. Used to be a golf professional and I really think you will get so much more enjoyment out of the game with some new clubs. Best analogy I can think of for this forum is would it be easier to learn on a new set of ski's or a pair of ski's from 1960 (patty berg are at newest from 70's but most likely the late 60's). Thanks for the heads up about the clubs. When I got to thinking about it, I compared golfing these clubs to skiing old straight, looooong skis with ancient binding systems and rear buckle boots. Since it's still not ski season and today is my birthday so I took the day off work (actually just finishing up an extended Labor Day camping trip), I am actually headed to the local golf store today to see what my options are. I didn't figure I'd get anything for trade in, but maybe I can sell them on Craigslist or in the neighborhood garage sale, or weld a sculpture, keep a few clubs (and balls) in my car for self defense, saw off the heads and make ski poles, make percussion instruments out of the heads. I'm now taking suggestions. I have at least 3 full sets that are at least 30 years old. Follow up: I already share a decent driver with DH (he plans on getting a new one for himself), and an ok putter, so I got a set of Tour Edge Lady Edge hybrids (5H-7H) and irons (8,9,PW,SW). They took a tiny bit of getting used to since I was forming bad habits from the old clubs, but once I found the sweet spots and adjusted my grip and stance a bit, I've been smacking the ball straight down the fairways with decent loft and distance. The old clubs never felt right. These do. Oh and a great story to add...the day I bought my clubs, I went to play by myself and a foursome of older gentlemen let me play through. I was sure I was going to choke since they were watching me. On a par 3 hole, I hit the ball nearly perfectly and my first shot landed and rolled about 6" away from the pin. After a round of "atta girl"s I grinned all the way to the green and sank the putt for a birdie! I am an avid golfer. I have been playing for over 25 years. I pretty much ski when it is too cold to play golf. Played 18 yesterday before the SB started. Shot a ridiculous 49 on the front, but recovered nicely on the back with a 38 (finished bogey, double though ). ABQ is great in that you can play golf and ski in the same weekend (done this a couple of times). Can't hardly beat that. 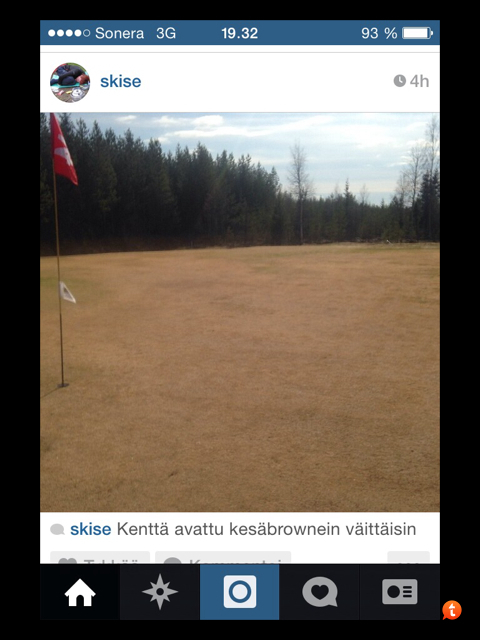 We pretty much closed down the golf courses - last game was sometime in late October. Blasted maple leaves all over the ground, and I lost four (4) balls on the fairway. I can make any crummy shot you like, miss putts, you name it - but what really sends me into the stratosphere is losing a ball on the fairway. Won't be able to start again until all the snow is gone from the ground, and it's dried out. Usually last week or so of April, here, maybe into May depending on how much snowpack we had, and how much of that snowpack was ice. Wow, i think they close our course when snow is on the ground. Amazing. One of the bonuses of skiing in VA is that it's possible to ski and golf on the same day almost everyday of the ski season. I don't, but that's because I'm a much better skier than golfer at this point. As for exercises, I start ski conditioning in August and get going even more in Sept. I put my favorite ideas into a fitness blog. You might get some ideas there. I do simple balance exercises all year long. Thank you! Great blog! I will add these to my program!!! Not sure if we'll play any more golf this season (not a winter sport where I live), but I am still hitting balls in my friend's large yard. I played a lot this summer and improved somewhat. I only started golfing about 5 years ago so it goes without saying that my skiing is way way better than my golf! But I'm totalling enjoying it - only play with friends who don't take it too seriously and who laugh at everything. No throwing of clubs into the water or other stupid things I've heard people do. I think attitude is important in any sport. Getting mad and throwing clubs etc is just not cool. I've been playing about 4 seasons now, and it really got better after lessons. Less injuries amd pain and generally feeling better and more confident and relaxed. I still am not a good player but I feel good. I am learning from that and enrolled in a bunch of ski lessons for this winter!